This spectacular new Auutmn fruiting Raspberry from Switzerland is set to out-shine Autumn Bliss, currently the leading Autumn fruiting Raspberry for home gardeners. Himbo Top's rather large fruits weigh a hugely impressive 6-8 grams each and are borne on long fruiting laterals; walking along a row of this variety, picking your huge, succulent fruits, and you will soon have an impressibe bowlful. Sumptuous, mellow, velvety texture, a full 8 week cropping period, and a highly impressive total yield are just some of the many qualities of this impressive new variety. The strong canes are noticeably less spiny than Autumn Bliss and the canes are quite upright in habit; suitable for cultivation without support and happy to be clipped back to a space saving single row if necessary. 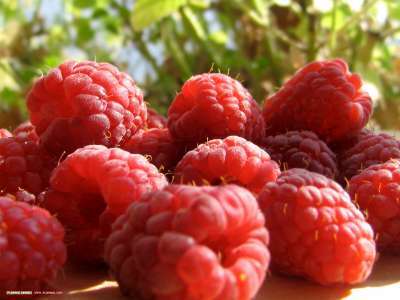 Huge sweet fruits, an 8 week picking period [from August to October] very heavy total yield... Himbo Top is the cream of any Raspberry planting programme & highly recommended.